Neighbors is a series that profiles ordinary people with extraordinary stories to tell. Think we should profile someone you know? Send your pitches to editor@southsideweekly.com. 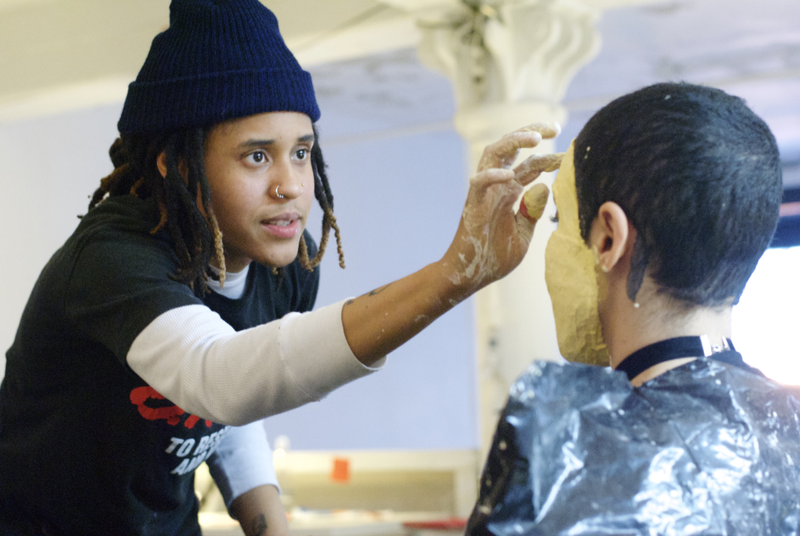 On a snowy Saturday afternoon at the Chicago Art Department, Ciera McKissick is hunched over, dabbing strips of plaster-covered gauze onto a model’s face. “It’s interesting because I don’t know these people,” McKissick chuckles. “It’s an intimate act, kind of, touching their faces.” The masks will eventually debut at a fashion show she’s putting on with Chicago-based brand Iridium Clothing Co., as part of her residency at the Chicago Art Department (CAD). During the day, McKissick is an activity worker and recess monitor at Hernandez Middle School in Gage Park. After work every day she goes to the CAD to plan a variety of art-related events. In February alone, she has three lined up: the fashion show, which is at the end of the month, follows a jazz show for Second Fridays in Pilsen and a global dance event at the Beauty Bar in Noble Square. The events are part of McKissick’s passion project: she’s the founder, editor-in-chief, and curator of AMFM, an online magazine of her interviews with artists of all kinds. AMFM (which stands for Arts Music Fashion Magazine) grew out of McKissick’s undergraduate thesis project as a senior at the University of Wisconsin–Madison in 2009. After graduating, McKissick continued to work on the magazine while also working various day jobs. McKissick, who is now twenty-eight, also uses AMFM as a platform for collaboration away from the web, putting on shows with local artists, particularly those who are invested in a social cause. Though she only arrived in Chicago two years ago, McKissick’s work connecting artists, musicians, and makers has quickly embedded her in the city’s arts scene. The Q&A is the backbone of AMFM, allowing McKissick to engage with artists on a deeper level. “Instead of inserting my own opinion or my own views into different pieces, I wanted to hear directly from the artist,” she says. Through AMFM, McKissick collects vignettes of artistic life: she has interviewed rapper Angel Haze about what she learned from living in nature, pop duo Sylvan Esso about the city of Milwaukee, and Los Angeles-based artist Tonia Calderon about the time she was commissioned to do a portrait for Dr. Dre. Though McKissick grew up in a city known for being highly segregated, she enjoyed bringing her classmates from other parts of town to her childhood home, which is situated in the zip code with the highest incarceration rate in the state of Wisconsin. “I love the idea of bringing people to different areas that they don’t necessarily know about or have preconceived notions about, and showing them that there are real people who live in these places, and they’re doing things, and there’s families,” she says. McKissick seems to be doing the same in Chicago. After post-graduation stints in Sacramento and Milwaukee, McKissick decided to move to Chicago in the summer of 2014, taking an apartment in Pilsen. She has paid homage to these murals in her work. One of her best-known projects has been “We Dem Boi(s),” an exploration and celebration of queer women and boi culture that culminated in a video shot along the 16th Street murals. AMFM collaborated with lifestyle brand Boi Society to produce and publicize the project. The music video has since been featured on AFROPUNK, the website behind the popular festival, and queer style website dapperQ. “We Dem Boi(s)” is just one example of McKissick’s penchant for giving local flair to a larger issue: her eyes and ears are always attuned to local happenings. If she visits a new neighborhood, she makes a point to look up events going on in the area. Making these connections is what McKissick envisioned when she came to Chicago. Further down the line, she hopes to make AMFM a collective, with her as an agent and manager of artists across the country. Ciera has always been someone that dances to a variety of melodies. She’s has an unmeasurabl and genuine love of people, and it reflects in everything that she does. She is truly a bright light, in a sometimes dark world.